Surgeons at Rancho Springs Medical Center were the first in the region to use the da Vinci® Surgical System. 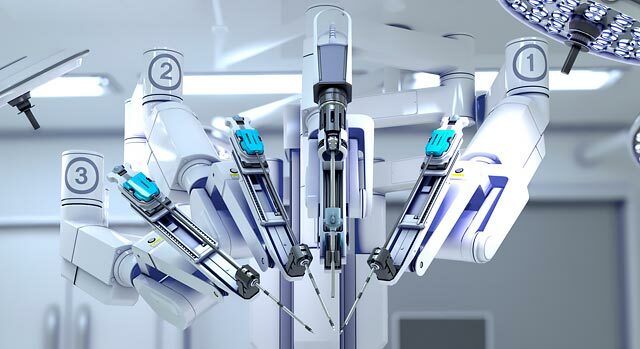 This advanced robotic platform allows doctors to perform complex procedures using smaller incisions than standard surgery with tiny, precision tools operated robotically. This may result in less pain, scarring, trauma and blood loss than other surgical procedures so that patients can potentially return to work and daily activities more quickly. The da Vinci® Surgical System consists of a surgeon's console, a patient-side cart with four interactive robotic arms, a high-performance 3D, high-definition vision system and the system's EndoWrist® instruments. Using advanced robotic technology, the da Vinci System is designed to translate a surgeon's hand movements into precise movements of the EndoWrist instruments. Learn more about how da Vinci® robotic surgery at Rancho Springs Medical Center has helped our patients return to the activities they enjoy sooner and with less pain in this educational health podcast. Both robotic surgery and laparaoscopic surgery are known as minimally invasive procedures. In both procedures, small incisions are used, which may result in less post-operative pain, reduced blood loss, less need for blood transfusions and a potentially faster recovery time. The two major drawbacks of conventional laparoscopy (without the use of robotic instrumentation) are that it relies on the use of rigid, hand-held instruments, and visualization is provided by a standard 2D video monitor rather than a 3D field. While standard laparoscopic surgery is performed using small incisions, the surgeon's depth of field, dexterity and precision may be variable. Not all procedures can be done robotically, and not all patients are candidates for procedures that can be performed robotically. The best candidates for robotic surgery are chosen on an individual basis by your doctor. Ask whether or not your diagnosis and situation will lend itself to robotic surgery.